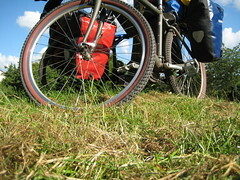 About The West Country Way cycle route. 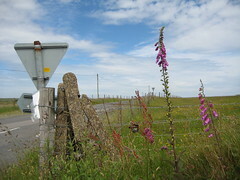 The West country way (WCW) can be cycled in either direction, starting of finishing in Padstow. One advantage about starting in Cornwall is that the wind will be behind you most of the time, due to the westerleys. However, don't feel restricted to cycle the parts that are waymarked, you should have 1:50,000 Ordnance Survey maps for the sections you are doing. This is so if you go off the Sustrans map you won't get lost and also you can check where you are with an OS map as it will have landmarks and land features on it that are not always on the Sustrans maps. The bike route is approximately 250 miles, which starts from Bristol, and follows a well signposted route to Glastonbury and the Mendip hills, then to the North Devon coast, which leads into the Exmoor National Park and down to the North Cornwall coast and the finish at Padstow. 3 sets of hills, plenty of time to relax and lots of tourist spots you will want to visit again! The bike journey can be done in 8 days by anyone who has done a bit of cycling, we were lucky we escaped the rain, however you should be prepared for the worst weather anytime of year. This is England! 3 challenging Hilly sections - The Mendip Hills, Somerset, The Exmoor National Park, Devon, and Bodmin Moor, Cornwall (all link to external pages). Food - eg: Snack bars, packet soups, sauces, rice. You will not be remote, shops in every town on route. Once you think you are ready - get all your kit together and do a few day trips out in your local area - to see how prepared your bike is for the trip, but more importantly whether you are fit enough!